Estate Planning is About Relationships | The Levin Law Firm - Philip Levin, Esq. 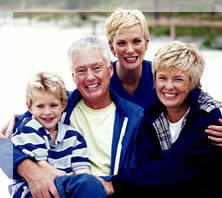 What is estate planning truly about? It’s about assets, laws, taxes, and documents of course; but deep down, Estate Planning is About Relationships. Since The Levin Law Firm focuses exclusively in the area of estate planning and probate matters, an important part of what we do is to create the best estate plan and asset protection vehicle for our clients. However, achieving this goal involves far more than simply designing and drafting legal documents—it involves listening to our clients, as well as reading between the lines of sensitive family dynamics and interactions. Estate planning also requires us to look into the future in order to catch potential problems which might arise, before they happen. A recent article in the Wall Street Journal describes an interesting strategy which some creative financial advisors will suggest in order to help clients achieve their goals. While The Levin Law Firm has not yet had to arrange personality-type charting sessions, this “running interference”, or acting as a trusteed advisor, mediator, and guide is exactly what we do, especially when we are engaged by executors during estate administrations. We believe that evaluating goals, assessing relationships, identifying priorities, and facilitating productive discussions are all part of being a responsive and competent estate planning attorney. Estate planning and asset protection may sound like it’s only about things and wealth, but as members of your advisory team, we know that estate planning is always about family and relationships. Please consider our approach when recommending legal counsel to your clients whenever they need an attorney to develop or revise their estate and business disposition plans. While it is important to engage a trust and estate planning attorney who is skilled in the tools and techniques required to protect your clients’ wealth, it is vital to work with estate counsel who is capable of listening to your concerns and implementing well crafted solutions designed to achieve the unique needs of your family. Wills, Trusts, and other important estate planning legal documents should only be prepared by a licensed estate planning attorney. To arrange an “Estate Planning Check-up”, contact The Levin Law Firm to schedule a Complimentary Consultation at 610-977-2443.